This mirrored three-drawer accent chest offers sophisticated style and ample storage space. Update your room with the gorgeous look of this contemporary accent chest. It comes in an silver mirrored finish and faceted glass knobs that offer a stylish sparkle. Brilliant trim beading surrounds the borders for an elegant touch. Three spacious drawers are built into this beautiful design for ample storage space. 32" wide x 30" high x 16" deep. Weighs 96 lbs. Each interior drawer is 21 1/4" wide x 13 1/2" deep x 4 1/2" high. Contemporary accent chest from the Trevi collection by Coast to Coast. Mirrored finish. Silver finish beaded border detail. Faceted clear crystal glass knobs. Three pull drawers with generous storage room. Knob assembly required. Its a great size and similar to the width og my current nightstands. Also my bed has a beaded nail front that i know will match perfectly. I saw something very similar to this in a local store your price was much better. They will go great with my King bed! I love this piece and have been searching for it for a while now, and this price is within my budget. Thank you. Perfect size, good sale price. Because it is mirrored, I hope it arrives with no damage. The beauty of it and the awesome price compared to others I’ve looked at and considered buying. To match my end tables. I haven’t received my order yet, but looking forward to setting them up in my bedroom. Its a gorgeous piece. It looks expensive and the price is beyond perfect compared to competitors!! Does this have drawer slides? Do the drawers open smoothly and properly? BEST ANSWER: Yes, the drawers slide in and out, but not smoothly. I purchase 2 of these chests last year and the drawers open smoothly with a built in drawer slide. My chests are on either side of the bed, and are used frequently. The drawers are quite good.... no problem at all! I must say it looks great in our guest room and it’s a perfect accent piece that would work in any room!! Yes it does. The drawers slide just fine. I love mine and everyone that walks into my bedroom notices it right away. They love it too! The drowers open smoothley when they have less staff. 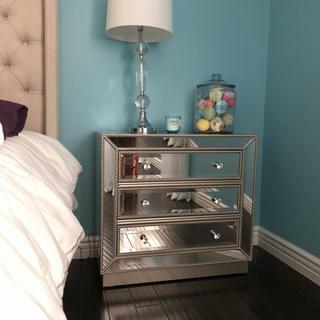 Does this item have an antique mirrored finish and does the silver beading have a champagne tone? BEST ANSWER: No - this does not include an antique mirror finish and the beading is silver in color. BEST ANSWER: We do not have Saturday deliveries for furniture pieces. Does this item come assembled or does it need to be assembled after shipping? BEST ANSWER: It came assembled, except easily screwing on the knobs. I love it. I bought 2, one for each side if my bed. Hi Hindy, it basically comes assembled you just have to screw on the crystal knobs . It comes assembled. We picked our new piece from the store and it was ready to use. Mine came assembled. - I purchased a floor sample. You will need to put the knobs on only. This piece really amps up our living room! I had been searching for something with antique mirrors, because I was worried regular mirrors would be too intrusive. No worries, the beveled edges break up the reflection and it looks really crisp in the room. The drawers glide smoothly and provide a lot of storage, the beaded trim is beautiful, and the crystal knobs (not plastic, fortunately!) add even more sparkle. I think this is a great value and I expect to love it for a long time. This item and others in this series have "the look" and the substance of similar items I've seen for five times the price. Definite value while being spectacular ! Looks nice but Horrible nightstand! I was so excited to purchase these nightstand. One of two came broken. They delivered a new one, but with no knobs. They painted the inside with the tracks already installed so their is dry paint on the tracks and the drawers don't come out we have to force them out so to avoid breaking them we just don't use them so they look nice but are useless. Love this dresser! So chic. I picked up at the store and brought them home. The store employees were great. They wrapped them up in bubble wrap so they wouldn't scratch. This is a nice quality PC...Looks sharp too. If you have it shipped, rest assure it will get to you in good shape. After watching mine fall from the fed ex truck I was sure it would be damaged...but nope. Great packaging saved the day. We love this beautiful piece that looks perfect in our second guest room! Exactly what I wanted and it was promptly delivered and arrived in excellent condition. I love it! 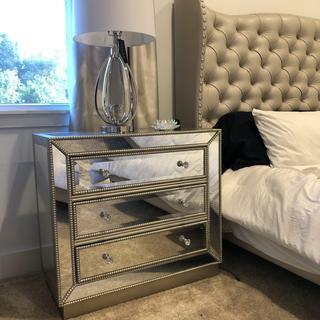 We love our mirrored accent chest and our lamps. The service was terrific and couldn't ask for more. Howard was amazing. He always takes good care of us. We love the dresser. It’s stylish and holds a lot! I was wory gor assembling it did not need any assembling just put the legs, ot looks so mice made my room bright. I love it only the drawes are not deep enough , it was very easy to assemble.